Preheat the oven to 200°C, gas mark 6 and lightly oil 2 baking sheets. To make the pastry, sift the flour and salt into a bowl. Put the water and butter in a pan and bring to the boil. As soon as the butter has melted, remove from the pan from the heat and tip in the sifted flour. Return to a low heat and beat the mixture well with a wooden spoon until you have a smooth, glossy dough that leaves the sides of the pan. Remove from the heat and beat for another 1-2 minutes, before adding the beaten egg, little by little. You should end up with a smooth, glossy dough which is stiff enough to hold its shape. Spoon dessertspoonfuls of the pastry into 12-14 round buns on the 2 baking sheets, spacing them well apart. Bake for 30 minutes then pierce each bun with a skewer so any steam can escape. Leave to cool in the turned-off oven with the door ajar. Meanwhile, make the chiboust cream. Melt the chocolate in a bowl over a pan of simmering water. Put the egg yolks, sugar and cornflour in a bowl and beat until pale and thick. Heat the milk in a pan until just below boiling point, then slowly pour over the egg yolk mixture, stirring well. Pour the mixture back into a clean pan then heat over a low heat, stirring constantly, for about 10 minutes, or until thickened. Do not allow to boil. Remove from the heat and then add the melted chocolate and stir until smooth. Leave to cool for a few minutes. Finally, beat the egg whites until holding stiff peaks, then fold into the mixture. Leave until completely cold before filling the buns. 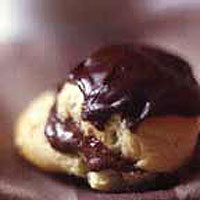 Split the cooled choux buns horizontally and fill with the chocolate cream, using a teaspoon. To make the chocolate icing, melt the chopped royal icing and chocolate together in a bowl over a pan of simmering water. Stir until smooth. Remove from the heat but keep the bowl over the pan as the icing sets quickly as it cools. Spoon icing over each filled bun, leave to set, and then serve. The religieuses will keep, refrigerated, for 24 hours before beginning to turn soggy.